Brown hamburger in skillet with oil and little onion. Season with 1 T of the Taco Powder (save remainder for dressing), seasoning salt, garlic powder, alt, pepper, and little salsa if desired. When browned completely put in bowl in the fridge to cool. 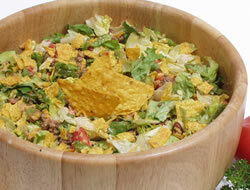 For dressing combine thousand island dressing with sugar, remainder of taco powder, taco sauce and a little salsa. 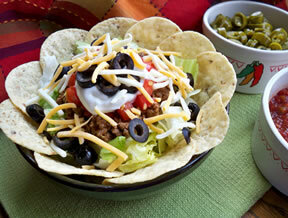 Toss all together and top with crushed Nacho chips.